If I compared a book to a twilit mountain range washed in purples and oranges and reds, the sight of it causing you, the reader who has trudged through a dull landscape of ordinary novels, to stumble in your sojourn and fall to one knee in reverence for the toothy horizon; and if I said reading this particular novel was as bracing and invigorating as drinking from a cold, clear alpine stream; and if I said it was gorgeous as a coffee-table book and deeply meditative as the Book of Psalms; and if I said just one book can, however briefly, change the way you look at both the natural world and human nature—if I said all that, you’d want to read this book, wouldn’t you? 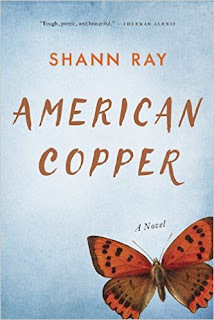 Good, glad to hear it, because American Copper by Shann Ray is all this, and more. And if you think I’m overstating the qualities of this novel set in Montana, well then my dear friend, it’s obvious you haven’t read it. I’m here to help you correct that oversight. American Copper has a huge timesweep, from the Sand Creek Massacre of 1864 to the years just before World War II, but it is, at heart, an intimate novel. It traces the intertwined lives of three individuals: Evelynn Lowry, daughter of a copper baron who all but owns the city of Butte, Montana; William Black Kettle, a Native American who works the rodeo circuit and longs for peace in the midst of violence; and a bear of a man named Middie who ends up working as a bouncer on a passenger train. With apologies to other great Big Sky writers like Ivan Doig and Norman Maclean, this is the Montana novel to end all Montana novels. Winter set in like the teeth of a badger. He felt the clean blade of pine, the rich taste of high mountains, the nicker of winter, windy and subliminal. The language in his mouth was stark and eloquent, warrior-like one minute but in the next moment as light-filled as water, and as lovely. If you’re looking for a beauty of a novel to give (or get) this holiday season, look no further than American Copper. Oh, can't wait to read it now! So glad I won it on your giveaway! I like Ivan Doig. Another recent Montana novel I liked is Black River by H. M. Hulse.